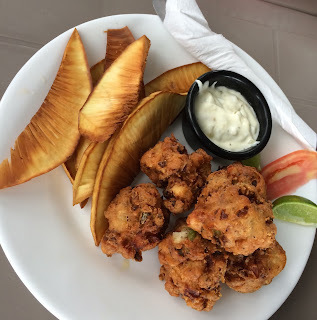 It's a local outpost of an LA chain called Xooro, which contends to sell gourmet Spanish fritters = churros. I had to give it a try. If you peruse their menu, the array of flavors were promising. When I went in, there was no one else in there but a rather bored young attendant. 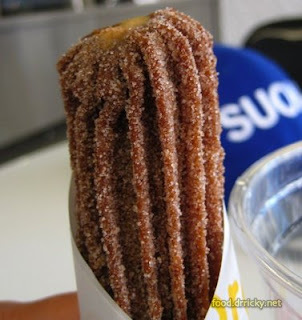 First of all, the store presentation is rather misleading - each churro they served is only about 60% the length of what the store display would have you believe. Which isn't necessarily a bad thing. And this is what I got. 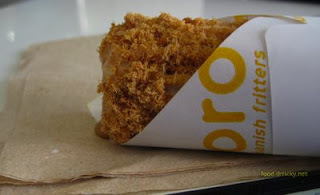 What coated this churro was not bacon, but unmistakably rou song, dried pork (or other meat) that has been flaked into a powder, usually served in Chinese cuisine to accompany congee. I objected to the sole attendant that perhaps there was a mistake - and she pointedly told me that that was bacon. Incredulous that they would attempt to pass off cheap flaked meat as bacon (not even close in taste or texture), I tasted it. It was definitely rou song...and the combination was terrible. If you decide to give it a try, stick with the classic. 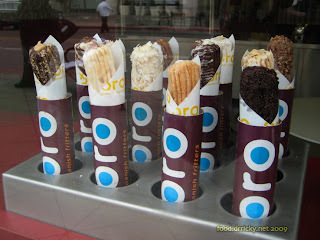 Which makes for a rather expensive churro - but hey, real estate in Santa Monica isn't cheap.